I was in Brussels visiting the Royal Observatory Belgium to talk about improving the accuracy of the International Sunspot Number. The ISN is the most important way we have to judge the Sun’s activity. Measurements from over 200 years ago have recently been found in several observatories and we would like to include them in the sunspot number. 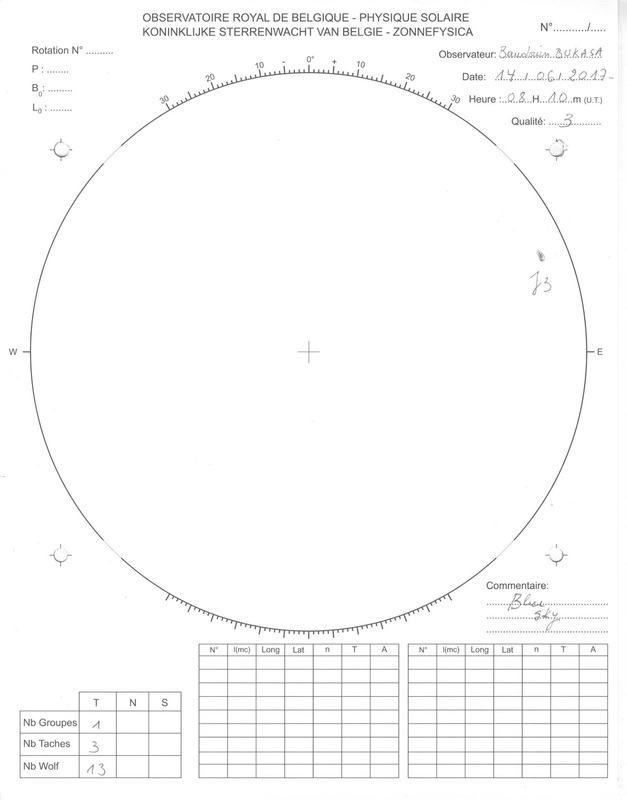 We are also looking at new ways to combine the data from the many observers who looked at the Sun since 1610. 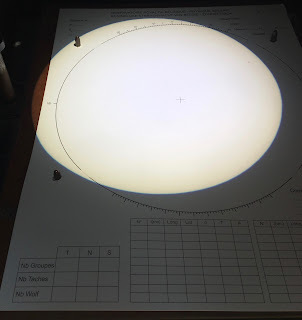 This would make the sunspot number record more accurate and help us understand the solar cycle. While at ROB I saw how the ISN is measured. The Solar Influences Data Analysis Center (SIDC) at ROB is the World Data Center for the sunspot number and also measures the ISN as often as possible. 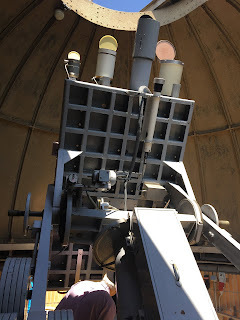 Under a white dome sits several telescopes designed to look at the Sun. 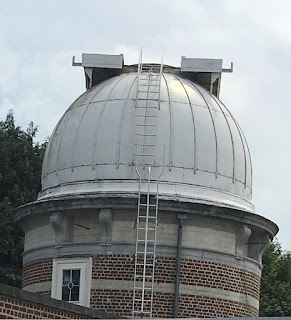 Every clear day an observer walks up the circular staircase to the floor of the observatory. 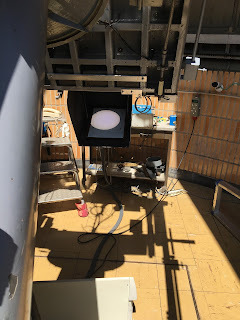 The long grey telescope projects a large image of the Sun onto a little table behind the telescope with four little spikes. 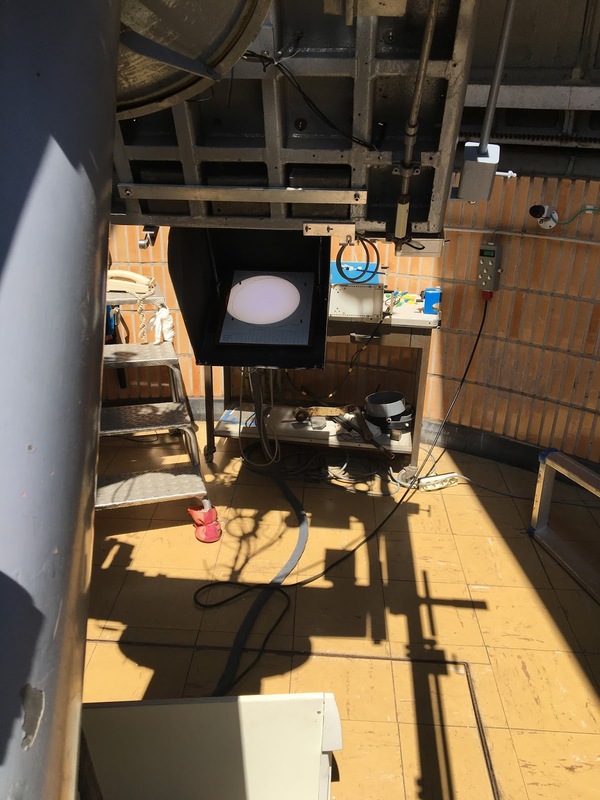 The other telescopes are also used to study the Sun. The observer secures a piece of paper on the spikes and draw what they see. There isn’t a lot of space and the back of your head can get very warm when it blocks the light of the Sun. Here is a picture of the actual drawing from that day. 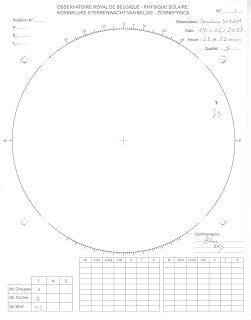 There is one small spot group with three visible spots. That makes the ISN, which is 10*number of groups + number of spots, 13 for 14-Jun-2017. This may change a little as other stations report, but the decline of Solar Cycle 24 is continuing. My thanks to the people at the SIDC for both hosting our meeting and giving me at backstage look at the solar observatory. You can get more information, including more drawings and pictures of the Sun, are the SIDC website.